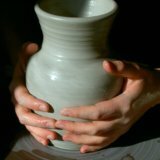 Plan to buy or build an electric, wood fired, gas or raku kiln? Find free info about ceramic kilns and kiln manufacturers. 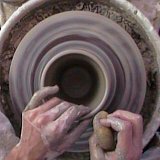 Whether you're looking for used kilns, electric kilns for sale new, review your kiln buying plans, kiln firing temperatures, or getting started using a pottery kiln, this is the place to be. Let's talk about the different types, brands and components of pottery kilns. First the different types. To read more about small electric kilns for sale that run on 120 volt standard household outlets, click here. 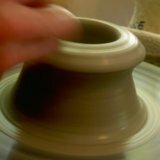 Wood Fired - I mention this first because this was the original firing method for pottery thousands of years ago. It ranges from simple pit fires to intricate climbing kilns. Regardless of the kiln structure, the fuel for the heat is wood. Wood firing is still very popular to this day because of the rich surfaces that it pruduces. Gas Fired - A more modern version of the fuel burning clay kiln uses gas. This allows more control over the temperature and a cleaner burning kiln. Gas is very popular because it still allows lots of option for creating rich glaze surfaces, without having to burn a ton of wood. Electric - The newest form of kiln burns no fuel. It is heated by electric coils. It is very clean and easy to control. Brighter colors can usually be achieved in electric kilns. However, electric kiln glazes tend to lack some of the richness of surface that can be achieved with gas and wood. Raku - Raku is unique in that it involves multiple processes. First the pottery is heated to red hot (usually in a simple gas kiln). Then it is placed in another fuel such as newspaper or leaves to smolder. This smoldering creates very interesting surfaces. Raku firing is really fast. It can be a great source of instant gratification in an art that is all about patience. Here are some of the major brands of kilns. They are Skutt Kilns, Paragon Kilns, Olympic Kilns, Cress Kilns, Amaco/Excel Kilns, L&L Kilns and Cone Art Kilns. All kiln manufacturers build their kilns a little differently. L and L kilns are very popular right now, and several of the other brands have long histories of popularity as well. Whether using wood, gas or electricity every kiln two structural components in common; insulated walls and shelves for holding ware. Fire Brick - Specially insulated kiln bricks used to build clay kilns. These bricks are much more delicate than normal bricks. However, they can withstand extremely high firing temperatures. They do an exceptional job of keeping the heat inside the kiln. Kiln bricks are available for sale where you buy other ceramic kiln supplies. You can repair most clay kilns when the bricks wear out by replacing them with new bricks as need. Gas Pottery Kiln Burners - Gas pottery kilns use burners to inject the flaming fuel into the kiln. Many burners are a fairly simple valve that mixes the air and fuel to create the correct firing temperature. Kiln Shelves - An important part of your ceramic kiln supplies is kiln shelves. They are specially constructed shelves that will withstand heat and support your pots in the high firing temperatures of the kiln. The shelves must fit with your pottery kiln design to maximize space while leaving a space of about 1" between the pottery kiln walls and the shelves. Thanks for reading this review about kilns and how they work. Happy Potting. 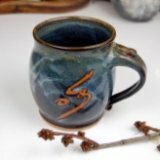 Learn how to fire an electric ceramic kiln.